1) Stop by Bank of Commerce in Oxford, MS, located at 1610 Jackson Avenue, and purchase your tickets. 2) If you're in the Oxford, Mississippi area, contact Clay Rodgers at jclayrodgers@bellsouth.net or 731-426-2764 to arrange purchase and delivery of your tickets. 3) Buy your tickets in The Grove prior to the Ole Miss vs. A&M game on October 12. Clay Rodgers will have tickets with him on gameday and you may purchase and pick them up before kickoff Oct. 12. 4) PURCHASE ONLINE! 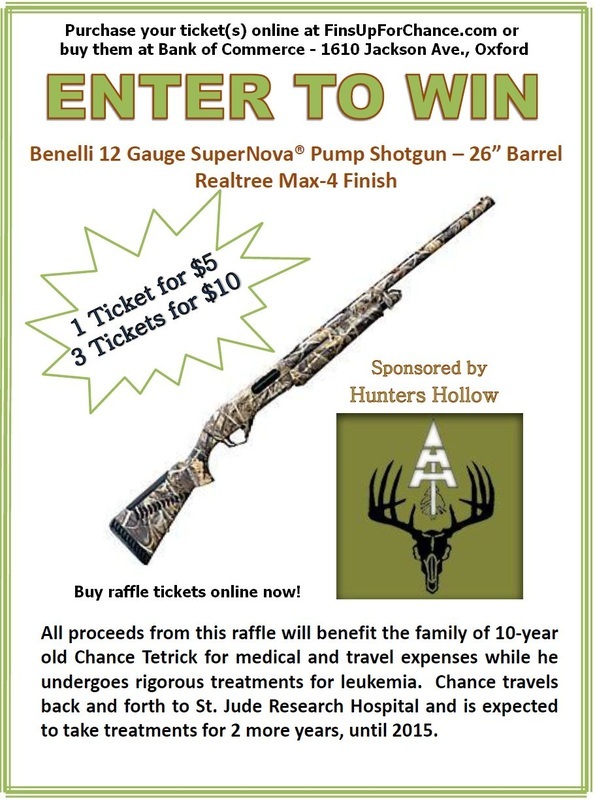 If you would like to buy raffle tickets online, please make your selection and click the "buy now" button to your right. Please note: As soon as your purchase is complete, we will e-mail your raffle ticket number(s) to you. We will ALSO promptly mail your tickets. Be sure and include the mailing address where you'd like your tickets to be sent. Please note: When you click "Buy Now," you will be taken to the secure PayPal website. You will be given the option to "choose your way to pay." If you do not have a PayPal account, no worries! Just click where it says: "Don't Have a PayPal Account?" on the opening screen and you will then be able to enter credit/debit card information.